With the constant thought of creating functionality, in relation to one’s daily rituals of food and “gathering” with friends, as well as making a beautiful object for one’s space in the home, Ross’s pots are for living. Ross’s beginning as a clay-maker, was a body of sawdust-fired decorative work, which she wholesaled to galleries and craft stores throughout the United States. Even though this line of pottery was successful, after several years, she wanted to have more of a connection to the user so she began making high-fired stoneware, functional pots – pots that her customers could actually use and enjoy in their daily lives. In 2007, Simon Levin came from Wisconsin to build Ross a soda kiln, which is a type of kiln that causes the pots to have an atmospheric and “accidental” quality. All these changes have one commonality – Function & the Vessel Form. Ross relishes the imperfections and tends to take advantage of their life force. For the last four years, she has been soda-firing to Cone 10, a process of firing pottery by introducing soda ash into the kiln at a later stage of the firing. The surface of the pots created by the combination of soda spray, clay and flame, is rich in texture, and the glazes are bright with depth and life. The mystery of “the accidental” is evident. Today, Ross can be found living, creating and working in her studio along the Ohio River near Louisville, Kentucky. 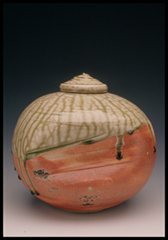 Her beginnings in art were as a painter, but later found her way to clay and received a Masters in Ceramics from the University of Louisville, under the esteemed functional potter, Tom Marsh. Having exhibited in galleries and juried exhibitions throughout the country, Ross is a regional potter, rooted in the tradition of pottery as a craft for contemporary living.